FEARLESS AND FABULOUS - WHAT'S NOT TO LOVE? We're onto "F" in the "List of More" and I'm looking at ways we can conquer our fears and start living the out the Fabulous Fifties! Being fabulous begins by getting a handle on our fears - if we let fear dictate our lives then we become shadows of ourselves and never really reach our full potential. Fear stifles us, it makes us second guess everything, and it holds us back from stepping out and discovering what lies ahead. How many missed opportunities have there been because we've let fear win? I know I've held back at times and played safe. I didn't fail, but I certainly missed opportunities to stretch my wings and possibly become More. Maybe it's an eldest child thing for me, where safety and responsibility are the drivers behind a lot of my decisions. I've come to see that it's so restrictive to always be scared to take the plunge. It's suffocating to always be worrying or wondering what others will think, or what if I fail? Isn't it better to know that you gave it a shot than to have missed the chance that may never come again? I look at all those Midlife women out there who are rocking this age and stage and they're become fearless. They might also think they're fierce and fiesty, but the biggest take away for me is that they're willing to own their own worth and their opinions and their life experience. They're not comparing themselves to the "youngsters" or to each other, they're embracing their uniqueness and they're thriving. 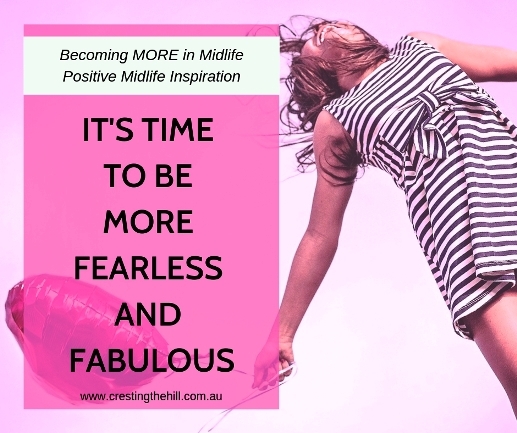 If you don't see yourself in that description of Midlife Womanhood, maybe it's time to ditch the fear and find that little kernel of courage deep within you. Maybe it's time to recognize the fact that life is short and we're into the second half of life - why not make it the best half of life? What would it look like if you pushed fear into the background and opened yourself up to the challenges that come your way? I know what it would look and feel like - it would look and feel Fabulous! We're finally at a stage of life where we don't need to worry or wonder about what others are thinking or doing. When you think about it, we've actually arrived at where we've been heading in the decades leading up to now. We know in our hearts who we are and what's important to us - they're the things that make us unique and fabulous in our own right. Why not own those things? Why not step up and say "this is who I am - take me or leave me" and stop fitting into other people's preconceived boxes? We don't have to compete with anyone, we don't have to compare ourselves to anyone. There will always be people who seem to have it all together or who seem to be living the high life, but if we're happy with who we are, if we're being our own cheerleader and embracing the life we've worked so hard for, then we're pretty fabulous in our own right. We can take risks, open ourselves up for new experiences, embrace our own quirky likes and dislikes, share our light with others, proclaim our fabulous-ness to the world around us. Confidence and fabulous go hand in hand - let's own them and get the most out of this one precious life we've been given - it's never too late to begin. Are you living with your fears? 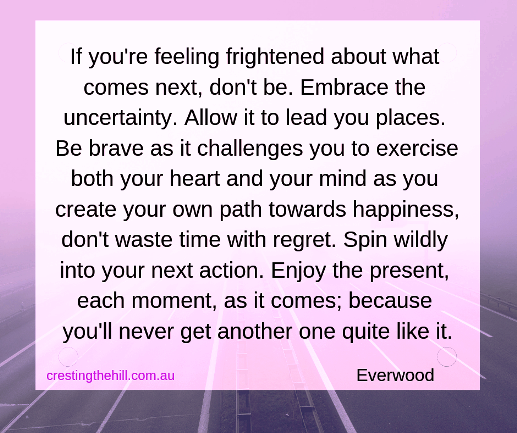 Or are you embracing your life and your uniqueness? 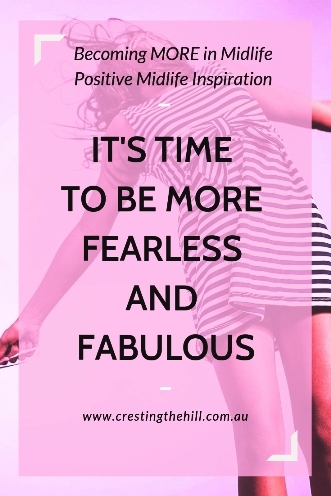 It's time to be fearless and fabulous - because (as the saying goes) if not now then when? I often wonder the same thing Sue - we may have been late to the party - but we're going to be one of the last to leave! As they say...Youth is wasted on the young! When I was younger I used to let fear lead me, but something changed when I hit my 40's and I started confronting my fears. I've climbed a few mountains and moved across the country. Who knows what else I'll do? It took me til my 50's Jennifer - but better late than never. I've faced different challenges to yours, but I love that I'm less scared these days. 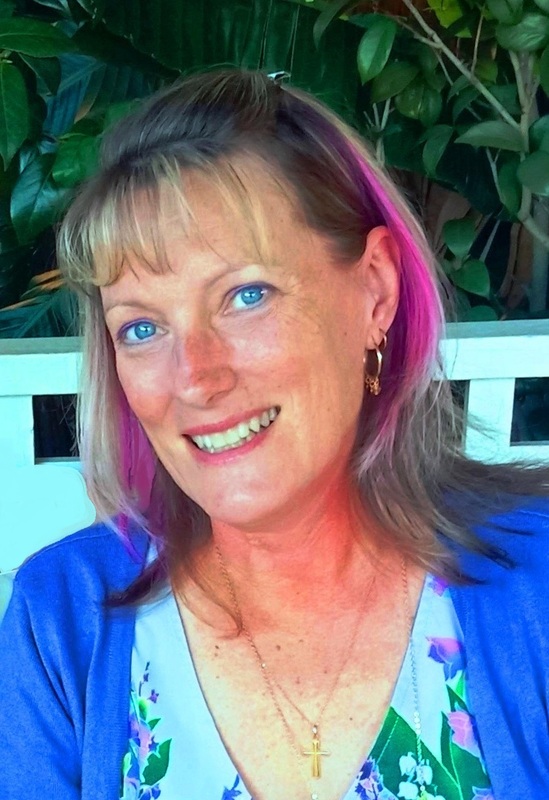 Hi, Leanne - Two of my biggest fears have turned into my most enjoyable passions. Before my first Camino, I was terrified -- and didn't think that I would finish (even Richard had serious doubts about me finishing). I also avoided hot yoga like the plague. By simply trying them, and taking one step at a time, these areas become two of my biggest passions. I am now preparing for my fourth Camino, and I regularly attend Hot Yoga. I would have never known this if I had let my fears win out. Great post! You always inspire me with all the different areas of life you tackle Donna. I want my retirement to look a lot like yours - maybe with less walking trails, but still the with the desire to keep discovering new things to try and conquer. Another great post Leanne! I've never been too fearful in general - but I've danced with 'this is who I am, take it or leave' all my life. I've realized that some of the most frustrating times of my life were when I was trying to fit in like a square peg in a round hole! 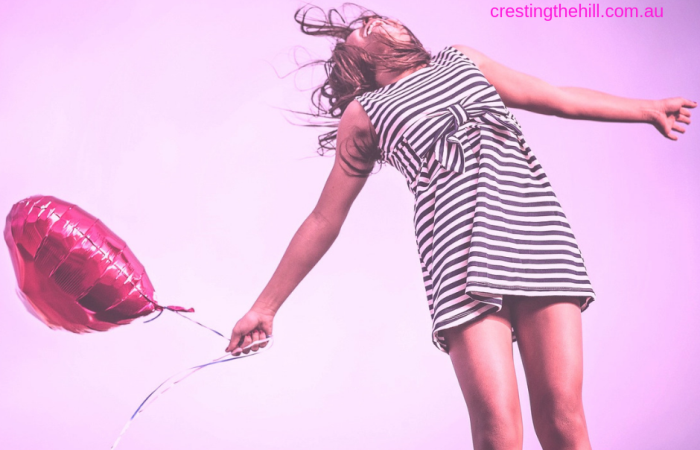 Ohhhh me too Janet - I've squashed myself into so many small places over the years (and suffered a little each time) It's nice to spread my wings and discover a bit of fabulosity in my 50's! I think you have a wonderful attitude. 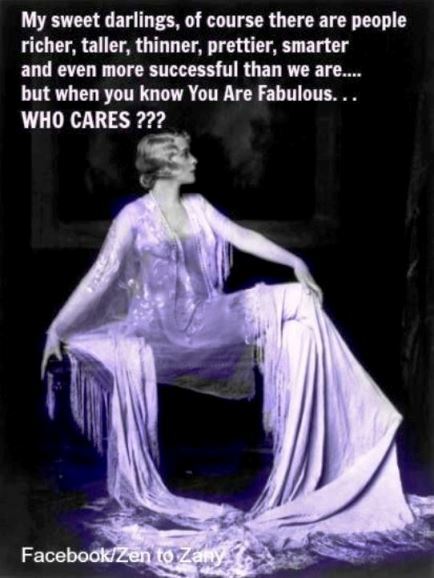 When I entered my fifties I finally did find my fabulous. I think I discovered my best self (and I'm a youngest child)! It makes me wonder why did I wait until then to step out of my shell! I adore your posts. I always find that super inspiring. I have some catching up to do. Oh yes, I certainly live with my fears. And I've been doing so for so long that I'm not even sure I remember what they are now and can't tell whether I'm still afraid or have developed the habit of apathy or not-trying. I also wish I could feel more fabulous. I grew up in that kind of era when you weren't supposed to stand out on purpose. I mean, you could academically or via sport but not just because of a big personality or who you are / were. That was considered arrogant I think - if it was only you thinking you were fabulous and you weren't generally agreed to be so (ie. via school or sports etc). If that makes sense.